Feel free to put your thoughts, observations and suggestions below. No need for cryptic clues today I think – this specimen is cryptic enough! matches my sheep bones for size. Interesting that it wasn’t predated while injured and survived successfully long enough for all that bone growth, so I’m thinking that it did not need to do a lot of running away or climbing or was protected by it’s family. 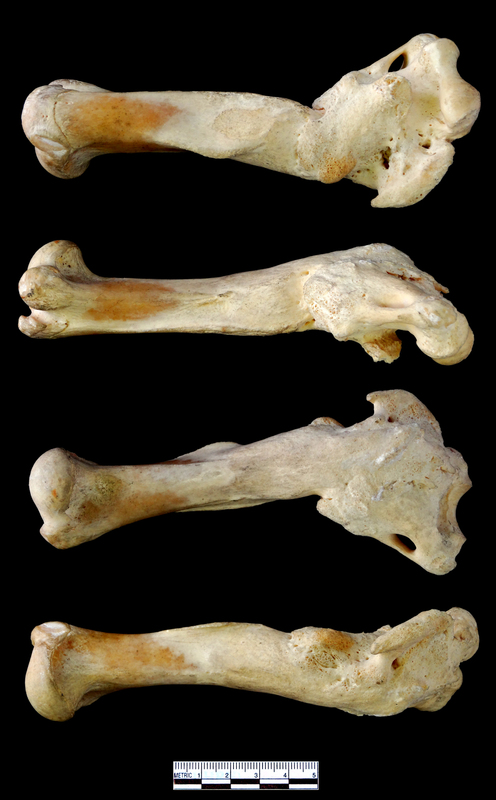 Interesting – the articulations don’t seem right for a sheep though and the tuberosity around the midshaft doesn’t seem usual for a sheep, although I suppose it might possibly be related to the pathology. Red deer humerus broken at the elbow ? Looks juvenile but I have an adult which had a poor diet and the growth plate edges are still visible although the tops and bottoms fused ? I think it’s a big wild animal anyway that wasn’t under the care of anyone because it healed itself. I think you’re probably right about that Jake – if this was a domestic animal it would have either been given proper treatment or have been put to sleep. 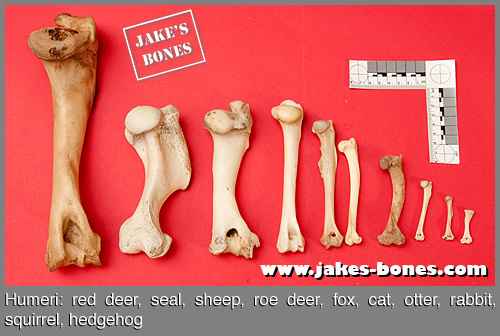 Not sure about deer – size is OK but the humeral head seems to be proportionally very small for any ungulate I’ve seen. It has a supracondylar foramen, which occurs in felids and mustelids. It looks natural and not like it’s a bone growth that was caused by the fracture. The edges of the trochlea are much sharper on my cat and badger humerii, but perhaps the “roundedness” could be affected by the fracture?